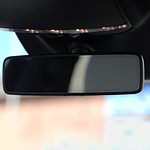 Have you seen the new auto-dimming features in rearview mirrors? These new electrochromic mirrors are the latest invention for vehicles that have night vision safety. With this technology, many drivers are able to prevent the Troxler Effect, which is the term for temporary blindness suffered from night time driving glare. This glare typically happens when bright headlights shine into a driver's rearview mirror, which causes blindness for up to two seconds or more. This effect is worse for those who have light sensitivities. However, auto-dimming takes care of all those issues. With a microprocessor built into the mirror, light is deflected using a photodiode or camera with a sensor. The mirror automatically changes to prevent the driver from ever seeing the glare. There are a host of new night-time driving safety feature as well as driver assistance options. You no longer have to fear night-time driving light sensitivities or even blind spot problems. See the difference in the latest cars by taking a test drive at Heritage Mitsubishi-Morrow.